HP 933 Cyan, Magenta & Yellow Original Ink Cartridges, 3 Cartridges (CN058AN, CN059AN,CN060AN) for HP Officejet 6100 6600 6700 7110 7510 7610 7612 | Replicafer Co.
HP 933 Cyan, Magenta & Yellow Original Ink Cartridges, 3 Cartridges (CN058AN, CN059AN,CN060AN). HP 933 ink cartridges work with: HP Officejet 6100, 6600, 6700, 7110, 7510, 7610, 7612. HP 933 ink cartridge yield (approx.) per cartridge: 330 pages cyan, 330 pages magenta, 330 pages yellow. Up to 2x more prints with Original HP ink vs refill cartridges. Original HP ink cartridges are specially designed to work with your printer to consistently deliver standout results throughout the life of your cartridge. Ensure that your printing is right the first time and every time with HP printer ink: 933 ink. 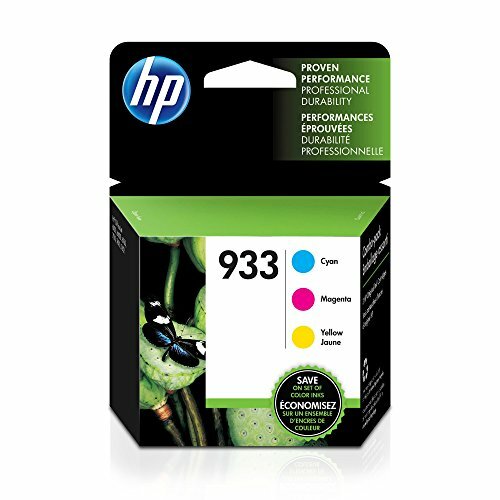 What's in the box: New Original HP 933 pack of 3 ink cartridges (N9H56FN): 1 Cyan (CN058AN), 1 Magenta (CN059AN), 1 Yellow (CN060AN) ink cartridge Colors: Cyan, magenta, yellow. HP 933 ink cartridges work with: HP Officejet 6100, 6600, 6700, 7110, 7510, 7610, 7612.